1981 boasted the largest number of new sets (5) since the first year, and included some very important new parts. 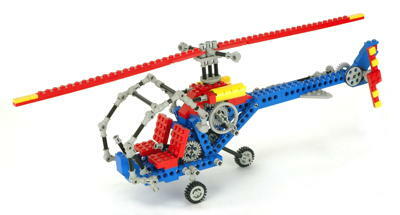 A new helicopter replaced the old and added retractable gear. 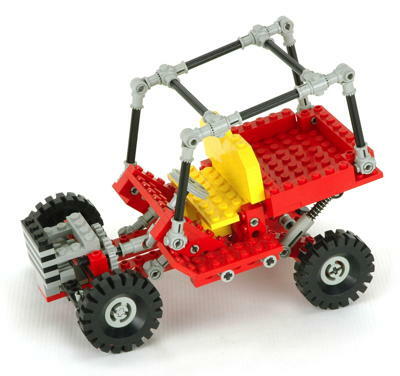 A buggy was the first small model to feature working suspension. 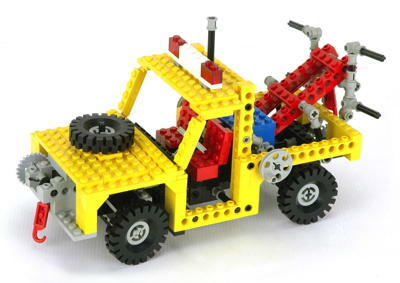 A tow truck was introduced which has a very large number of features for its size, including two winches and a wheel lift. A large truck features a dumping bed and lifting scoop. 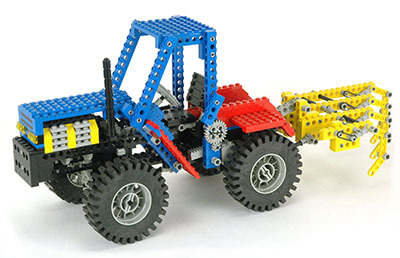 Finally, a large new tractor (harvester) was introduced with a reciprocating engine and a wide range of available implements. More pinned construction was used than in the past, and a few new parts really changed the way models were built. Toothed connector elements were introduced which allowed axles and links to be locked together at a variety of angles. These parts were used extensively in 1981, and appeared on every model. A 1/2 pin was introduced which was only one stud wide. 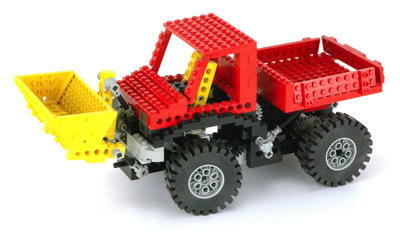 This has become one of the most basic Technic parts to this day. Finally, and most importantly, specialized steering elements were introduced which replaced the much bulkier 2x2 turntables previously in use. These parts would be used on virtually every new wheeled vehicle for the next decade, and on many beyond. A series of toothed elements were introduced which allow assembly at positively locking angles. The basic element, the toothed connector, looks very much like the old connector (which was retained), but has some important distinctions. The end with the cross hole is now only 1/2 stud wide, and is shifted to one side so that another connector can be mated with it and the pair will remain a total of one stud wide and be centered on the perpendicular axle. The orthogonal hole has a cruciform slot to lock onto an axle like the old connector. The most important areas of the new connector are the toothed ends. There are a total of 16 teeth around the circumference, allowing the part to be mated with other toothed elements at any angle which is a multiple of 22.5 degrees, including of course 90 and 180 degrees. A very subtle design detail makes this possible. The teeth are not perfectly aligned with the axle slot, but are rotated 1/2 tooth width (11.25 degrees). This makes it possible to mate two parts at parallel and perpendicular angles and be perfectly aligned. Besides the connector, several other toothed elements were introduced. A toothed bushing is 1/2 stud thick with an axle slot. 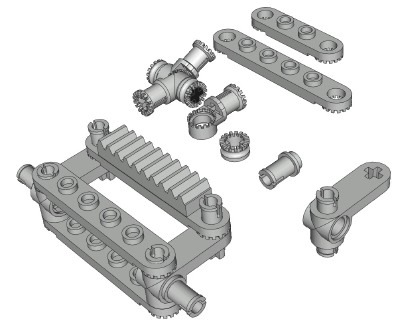 Also, toothed links from length 4 to 8 can be used as regular building elements via studs in the middle, or as specifically angled links using the toothed ends. A new 1/2 pin allows new construction possibilities. Since it is only 1 stud wide, it is not useful for connecting two beams like the old pins. However, one end protrudes slightly and has a stud on it which can be used to attach traditional studded elements. A control arm part was introduced which was specifically designed to be part of a steering system. This part has an upper and lower pin joint which allows rotation around a vertical axis. A perpendicular hole along this axis is used for a wheel axle. Another cruciform hole on an arm is used as the tie rod input. A sample steering assembly constructed of these elements is shown in the picture. 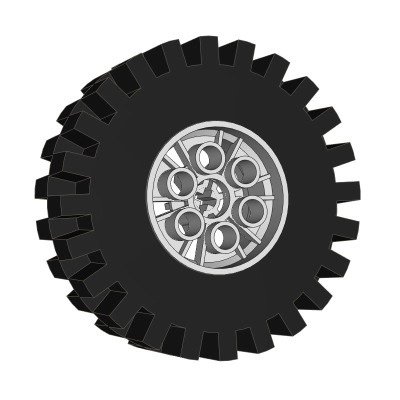 A new, smaller set of 20x30 foam wheels and tires was released which matches the style of the existing 24x43 tires nicely.